News emerged last week that one of the most well-known characters in sport had been relieved of his duties. John McCririck, who has fronted Channel 4s horse racing coverage since its inception in 1984, was in his own words ‘sacked’ in favour of a new look team, which will be headed up by Clare Balding. 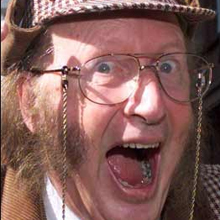 McCririck has reacted angrily to the move, with The Mirror reporting him as saying: “I'm devastated. I've been covering TV betting for 31 years…According to Channel 4 I'm being sacked after audience research. Yes, I do antagonise people, as reactions to me on Celebrity Big Brother proved. But I was never asked to change my presentation style…it’s so sad Channel 4 have again gone down the path of ageism” His comments regarding ageism refer to the fact that the new team of presenters, which is 13 strong, includes just one member who is over the age of 50. The move has come after IMG Sports Media won the contract to produce Channel 4s racing programmes. The broadcaster will be the only terrestrial channel covering horse racing, after the BBC exit the arena at the end of 2012. Many faces that race enthusiasts are familiar with will remain, with Rishi Persad and Grand National winning jockey Mick Fitzgerald moving across from the BBC. Survivors from the current Channel 4 line-up include Jim McGrath, Emma Spencer and Alice Plunkett. The shakeup is seen as an attempt to modernise the Channel 4’s racing coverage, with Sports Editor Jamie Aitchison stating: “Sports fans have something to look forward to - our racing coverage will be insightful, intelligent and ground-breaking. I'm hugely excited about the future of racing on Channel 4 and greatly look forward to 2013. I would like to thank all of the presenting team for their commitment and enthusiasm to Channel 4 and the racing coverage over the years.” Whilst Aitchison’s words may ring hollow for John McCririck we are sure, following his appearances on Celebrity Big Brother and Celebrity Wife Swap, that he will be able to reinvent himself and won't be short of offers in the future. However, there is no denying that the absence of his trademark deerstalker hat, catchphrases and use of Tic-Tac will take some getting used to. Will racing coverage ever be the same? If you have any thoughts on McCririck’s exit, or the new racing team that will be taking over in 2013 then we’d love to hear them.